A total solar eclipse will occur across North America on August 21. Solar eclipses happen when the Moon blocks our view of the Sun (read more about how eclipses work). From PEI, the eclipse will be seen as a partial solar eclipse – at the eclipse maximum, the Sun will be about half covered by the Moon, as shown in this simulation of the eclipse. The eclipse will start at 2:42pm, reach maximum at 3:50pm, and end at 4:54pm. It is very important that you do not look at the Sun unless you are using safe, approved Sun viewing equipment – and sunglasses do NOT count as safe! So how can you view the eclipse safely? We’ll be hosting an eclipse viewing on August 21 from 2:30-5:00pm on the UPEI campus. We’ll have glasses that you can wear to view the Sun safely plus special solar telescopes that will provide a safe, magnified view of eclipse. There will also be some fun activities for all ages to learn about eclipses and our solar system. Our eclipse event will take place outside of the School of Sustainable Design Engineering building (building #30 on campus map) from 2:30-5:00pm. The eclipse maximum will occur at 3:50pm (the moment that the Sun will be the most covered by the Moon), but if you stop in at any time during the event you’ll get to see the Moon partially blocking our Sun and look at the Sun’s features through a telescope. The eclipse viewing event will be held outside and inside the entrance of the SSDE building (indicated by orange star on the map). Parking is available in UPEI Lots D & E and the MacLauchlan Arena lot. 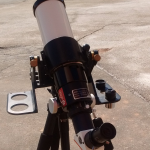 UPEI Physics’ hydrogen-alpha solar telescope. In the event the sky is completely clouded over, we’ll watch NASA’s live-stream of the eclipse and we’ll still have some fun activities relating to our Sun, Moon, and solar system. 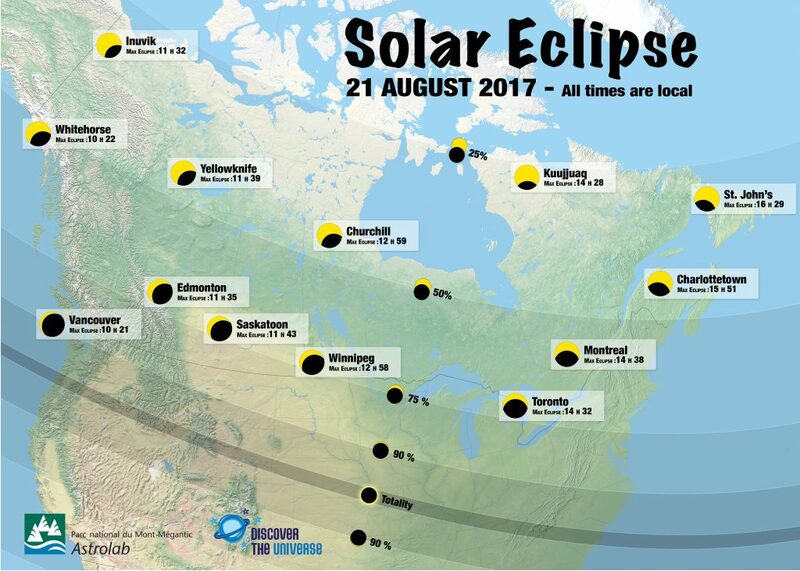 There may also be an eclipse viewing event taking place in western PEI. Check the Athena Community Astronomy Club’s Facebook page for updates as they are considering hosting an event. If you can’t attend a public eclipse event, you can still view the eclipse safely at home, provided that you do a bit of preparation. Below are several safe viewing methods that you can try depending on what materials are available to you. Try them out on a regular sunny day to practice so that you are ready once the big eclipse day comes around. Buy your own eclipse glasses. These are getting in short supply as the eclipse draws near. As of the time of writing, Keith Cooper of Sidewalk Astronomers of Charlottetown still has some pairs available for sale (UPDATE August 8: Keith is sold out!). 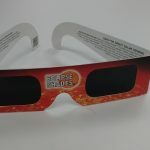 Astronomers Without Borders are also selling solar viewing glasses, but these ship from the USA so you may have to check whether they will arrive in time. If you decide to buy eclipse viewers elsewhere, beware that potentially unsafe glasses are being sold. Read this information from NASA and from the American Astronomical Society to be sure that the viewers you are purchasing or already have are safe. If you think you’d like to photograph the eclipse, read these tips on how to do it safely and still get good pictures. The next TOTAL Solar Eclipse for PEI? The eclipse this year is only a partial one for PEI, but don’t despair – we should get to see a total eclipse in the coming years. On April 8, 2024, the path of a total solar eclipse will pass directly over western PEI. Mark your calendars!